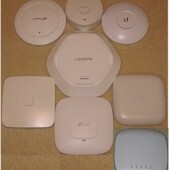 Discussion in 'Wireless Buying Advice' started by Tree_Burner, Mar 19, 2019. The home I recently moved into has a different layout for the network, and I am struggling with making a decision on updating my router. My connection to my ISP is in the basement utility room, against the back wall, with a single Ethernet output. Right next to this connection is a patch panel that is wired to ethernet ports all over the house, wired with cat5e patch cables. My setup goes like this ISP > basement router (tp link something, not important, it is not mine, but needs to stay connected) > patch panel > Netgear N600 (WNDR3700). the tp link sits in the basement right next to the patch panel, allowing my basement dwelling tenants (my mother) their own connection to the internet, separate from my own, but also allowing me to use it as a switch and run the internet through the patch panel to my router that sits upstairs in my office. This is obviously not ideal. Upstairs in the office are 2 desktops that I would like to continue to have a wired conneciton to the network. I would like to have a possibility of patching in to the Ethernet port next to my TV, in a separate room from the office. Buy a new router (such as the Asus AC1900) upstairs to replace my WNDR3700, as it is showing it's age. Keep everything else the same. Some other option I have not thought of. If you have any ideas that could help me decide if it's worth starting to seriously upgrade my system, or just get a simple solution of a consumer router. I am only planning on staying in this house for another year and a half or so, so I will have to modify what I do then. Do any of the rooms (office?) have more than a single Ethernet cable? Do any of the rooms have their Ethernet connections on the same wall? What is the purpose of the 'tp link something' router? How many floors is this home? How many square feet? How are the walls/floors constructed? Buy an RT-AC66U B1 (well within your budget) which is the current incarnation of the highly regarded RT-AC68U that has been praised since 2013. Use this router to connect to your ONT from your Fibre connection. From one of the RT-AC66U B1's router LAN ports, connect to the WAN port of the WNDR3700 for your downstairs tenant (mom). From another one of the RT-AC66U B1's router LAN ports, connect to the WAN port of the 'tp link something' router. From the remaining two LAN ports on the RT-AC66U B1, connect to the patch panel for the devices you want. (at least 3 port) in that room. The WiFi signal should be more than sufficent throughout the home. Even with all these routers in the basement. Just make sure that you choose the Control channels wisely so that they do not conflict with each other. Tip: choose the strongest Control channel for the RT-AC66U B1, in my experience, that has consistently been channel 11. Connect your Ont to the patch panel to where your new RT-AC66U B1 has access to two or more Ethernet cables upstairs. Connect one of these cables to the WAN port of the RT-AC66U B1. Connect at least one more to the LAN ports. In the basement, use an inexpensive GbE switch (at least 5 port) to connect to this LAN cable from upstairs. From the switch, connect to the WAN of the 'tp link something' router. From the switch, connect to the WNDR3700 for your downstairs tenant (mom). The remaining LAN ports on the RT-AC66U B1 upstairs can be used to wire your two desktops. The WiFi coverage upstairs should be superior to Scenario 1 above. Make sure to still use unique Control channels for each band on your routers. As you can see from my suggestions above, I don't believe in needlessly using an 'AP', range extenders or repeaters/media bridges. They make things needlessly complicated and usually means a far less performing network too. Be sure to use RMerlin's latest firmware with the new router. I would also recommend the use of the excellent scripts provided by amtm, Diversion via thelonelycoder, the FreshJR script for QOS and the Skynet and Stubby scripts too to keep your new network safe. Anything more than the above two purchases for the next 18 months at this location will probably reusable-usable in a new location. 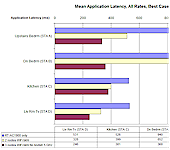 At least, not optimally. Wait until you know your new situation and we can pitch more suggestions then. Sorry, I was away from home when I wrote this so I didn't have all the details , but now I have more. The current router in the basement is actually a Tenda, not a tp link. That is my mom's router. The home is 2500 SQ feet, 2 floors (basement and ground floor only). Each room only has 1 Ethernet port. I just did a quick check, and while in the master bedroom in the far corner I have a pretty solid connection to the Tenda router in the basement, so I think your 1st suggestion is a pretty decent one. As far as switches go, there's so many options. Would this be acceptable? Thanks for the additional details. That switch is fine, I don't have personal experience with it, but with 20-year-old tech, a switch is a switch is a switch in 2019. 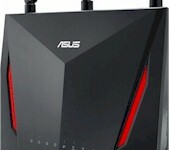 The brand of your mom's router isn't too important (I am assuming she is not a gamer!). 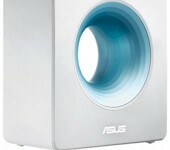 You may want to read one of my first impressions of the Asus RT-AC3100. The link below is from my signature. Not that I am suggesting it for your use, unless you can stretch your budget, of course. 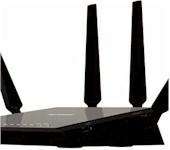 More to show that the size of the home you have is well within the limits of today's routers. I have this switch as well as a TP-Link 5 port Easy Smart switch. No problems with either one. Pretty much set it and forget it. okay, I now have the AC66U B1, and I set up the Merlin firmware. things seem to be good right now. joltdude and L&LD like this.